In this Feb. 16, 2017, file photo, people walk by a Pret A Manger in London. The British Sandwich shop chain is being taken over by German controlled investment group JAB Holding Company in a deal worth more that 1.5 billion pounds sterling. 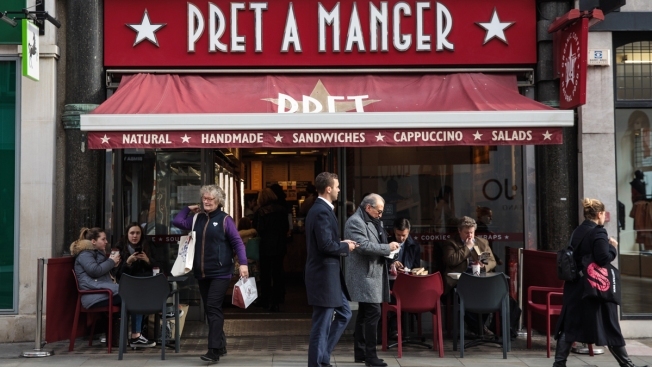 The restaurant chain Pret A Manger is being acquired by the European investment firm that bought Panera Bread last year. JAB Holding Co., based in Luxembourg, did not disclose the financial terms of its deal with the current owner, the private equity firm Bridgepoint. The sale is expected to close this summer. Pret has 530 locations, known largely for sandwiches and salads. Its biggest presence is the United Kingdom, where it is based, but it also runs restaurants overseas, including in the U.S.
JAB bought Panera last year for more than $7 billion. JAB also has controlling stakes in Krispy Kreme Doughnuts, Keurig Green Mountain, Peet's Coffee & Tea, and Caribou Coffee Co.